Seven Top Tips for Facilitating C-Suite Executives. Getting top-level executives to do anything creative is a stretch for even the most talented and imaginative facilitator. Yet polls indicate this to be a priority. Most CEOs list creative problem solving and innovative thinking as the number one leadership trait required for effective 21st century leaders. Innovation and creative thinking needs to happen at all levels within an organization. So how do we get these senior teams to “play” with us? 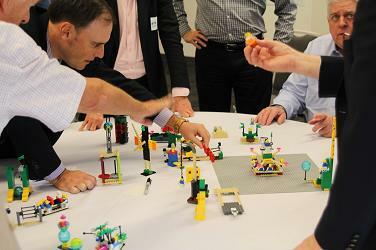 Here are our seven top tips to help you facilitate at this level and get to innovation. 1. Make sure the leader is in full support of you and your approach to set the tone. 2. Connect the relevance of your session or workshop with their articulated goals. 3. Reference well-researched data and scholarly journals, in point form. 4. Use professional, high-quality tools and equipment. 5. Give examples of your case studies, testimonials, and success stories. 6. Make good use of every second you have them together in the room. 7. Establish ground rules, such as no hand held devices and no observers. Some senior teams might think innovation is something they can leave for staff. They can just wait for someone else to develop something innovative for them. And when it is ready, it will dramatically improve services or increase ROI. Canada and the U.S., along with Eastern European countries and Australia, are just starting to realize the power of play, the value of creative thinking, and the connections to innovation and sustainability within their industries. They have watched as big brands who once dominated the market could not change and became redundant, think Blockbuster Video, Research in Motion, and Polaroid. We work with top-level executives in all levels of government, universities, utilities, health care, private companies, NGO’s, and non-profits where the leadership teams understand the old way of doing things no longer works. They want to stay relevant. And they know the key is to find a fresh approach to thinking processes. Are you and your friends up in the C-Suite thinking you’d like to take a stab at creativity for yourselves? We’d be happy to arrange a call to discuss it with you or to answer any questions you may have. Send us an email at info@strategicplay.ca and we’ll get back to you soon.